The Distillery District is a great place to spend a few hours if you're in downtown Toronto and want to get away from the usual downtown stuff. This pedestrian-only village is set amidst fabulous heritage architecture and is devoted to promoting arts and culture. You won't find a franchise or chain operation here, so all the stores and galleries are one of a kind. The Distillery District is a labour of love for a small group of visionaries who not only wanted to launch a business idea but create a vibrant and unique neighbourhood unlike others in Toronto: one that was free of typical urban trappings, like cars, unsightly signage and chain stores. The result is an historic neighbourhood that is not frozen in time, but alive and modern. Site tours are available at the Distillery Visitor Centre. 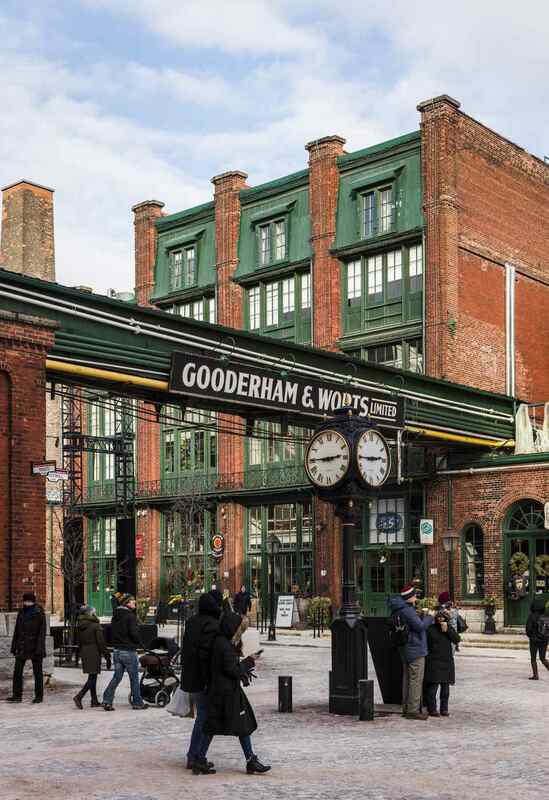 The Gooderham & Worts Distillery, one of amongst 40 buildings that constitute the largest and best-preserved collection of Victorian Industrial Architecture. Franchises and chain operations are forbidden, so tenants give district unique charm. Hundreds of films have been shot here, including Chicago and X-Men, so you never know when you’ll catch a glimpse of Hollywood in the North. Balzacs, a funky, independent coffee shop is a welcome change from Starbucks on every Toronto corner. The Distillery District has more than a dozen places, ranging from chocolate shops, to sandwich stops, a pub and fine dining. Several patios are open seasonally for outdoor dining. Soulpepper Theatre is one of the backbones of the Distillery District and offers a year-round diverse repertory season which is grounded in the classics and committed to the creation of new works, new forms and innovative practices. Several other venues present dance, theatre and song. Many commercial galleries have indigenous, traditional, and contemporary art for sale. The Distillery District features a wide range of more than 20 stores that sell unique items, ranging from arts and crafts, clothes, jewellery, furniture, kitchen supplies and one-of-a-kind stuff. From Union Station, take the subway to King station on the Yonge-University-Spadina line. Walk or take 504 King street car few blocks east to Parliament. Walk 2 blocks south on Parliament to Mill St. The walk from Union Station is about 20 minutes along Front Street or about a $10 cab ride. Check the Toronto Transit Commission (TTC) for subway, streetcar and bus routes and times. St. Lawrence Market: Heritage area with gourmet delights. The Beach is an east-end Toronto neighbourhood known for its prosperous population and high real estate prices.